Air Mauritius Limited, operating as Air Mauritius, is the flag carrier airline of Mauritius. The airline is headquartered at the Air Mauritius Centre in Port Louis, Mauritius. Its main hub is Sir Seewoosagur Ramgoolam International Airport. The company is the fourth largest carrier in Sub-Saharan Africa, and has an important standing in the European, African, and Indian Ocean region markets; the airline won the “2011 Indian Ocean Leading Airline Prize”, making it the seventh year in a row for it to win the award. The company was set up on 14 June 1967 (1967-06-14) by Air France, the BOAC enterprise, and the Government of Mauritius, with a 27.5% stake each; the balance was held by Rogers and Co. Ltd., the general sales agent for Air France and BOAC in Mauritius. A UK-registered Boeing 707-420 in Air Mauritius livery at Orly Airport in 1978. In the beginning, the carrier operated international services in conjunction with Air France, Air India and British Airways, which jointly had a 25% holding in Air Mauritius at that time. :1131:41 Until 1972, the company restricted its activities to ground services only; it started flight operations in its own right in August 1972 with a six-seater Piper PA-31 Navajo aircraft leased from Air Madagascar, connecting Mauritius with Rodrigues. :41 The aircraft wore an Air Mauritius decor, but kept a Malagasy registration. In 1973, a wet-leased Vickers VC10 from British Airways enabled the company to launch a long-haul route to London via Nairobi,:41:474 whereas services to Bombay were operated by Air India. The Navajo was replaced with a 16-seater Twin Otter that was acquired in 1975. When an agreement with Air France and British Airways came to an end, a Boeing 707-400 wet-leased from British Airtours helped the airline to start long-haul services in its own right. Long-range operations started on 1 November 1977 (1977-11-01). :1131 A second Twin Otter arrived in 1979. By April 1980 (1980-04), the company had 414 employees and a fleet of one Boeing 707-420, one Boeing 737-200 and two Twin Otters to serve a route network of passenger and cargo services to Bombay, London, Nairobi, Réunion, Rodrigues, Rome and Tananarive. Ownership of the company had changed to have the government of Mauritius as the major shareholder (42.5%), followed by Rogers & Co. (17.5%), Air France and British Airways (15% each) and Air India (10%). 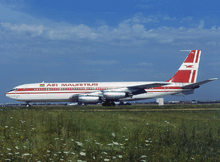 Air Mauritius acquired a second-hand Boeing 707-320B in 1981. It had previously belonged to South African Airways (SAA), and permitted the airline to return the Boeing 707-400 to British Airtours. In November 1981 (1981-11), a joint service between Air Mauritius and Air Madagascar began in the Tananarive–Mauritius–Comoros–Nairobi and Réunion–Mauritius runs, following the lease of an Air Madagascar Boeing 737. During the early 1980s, routes to Durban and Johannesburg were inaugurated using Boeing 707-320B aircraft flown with Air India and British Airways crews. The incorporation of a second aircraft of the type, bought from Luxavia, allowed the carrier to expand the European route network to Rome and Zurich in 1983, whereas Paris was added in the mid-1980s. Leased from SAA, a Boeing 747SP named ″Chateau de Réduit″ entered the fleet in November 1984 (1984-11) and was deployed on services to London. By March 1985 (1985-03), the fleet comprised two Boeing 707-320Bs, a Boeing 737-200, a Boeing 747SP and a Twin Otter. That month, the first of two Bell 206 JetRangers was incorporated. In April, a 46-seater ATR42 was ordered, and Singapore was added to the route network with a weekly service using Boeing 707 equipment. In June that year, Air Mauritius joined the African Airlines Association. In 1986, a second Boeing 747SP that was also leased from SAA entered the fleet; it was named ″Chateau Mon Plaisir″. The incorporation of this aircraft allowed the carrier to phase out a Boeing 707. In 1987, South African Airways' landing rights on Australian soil were suspended by the Australian government and Qantas ceased its operations in South Africa. There had been an increase in demand from businessmen since that time, as most passengers travelling from South Africa to Australia had to stop at Hong Kong, Taipei or Singapore. Given that landing rights in Australia for Air Mauritius had not been approved yet, a Boeing 747SP non-stop service to Hong Kong commenced on 1989-10-29, in cooperation with Cathay Pacific. Flights to Kuala Lumpur had started in May 1988 (1988-05). An Air Mauritius Boeing 767-200ER on approach to Chek Lap Kok Airport in 2006. The airline received two aircraft of the type in April 1988 (1988-04). Valued at US$122 million and financed by a group of banks that included Barclays, BNP, Credit Lyonnais and the Spectrum Bank, the company took delivery of two Boeing 767-200ERs in April 1988 (1988-04). These aircraft were named ″City of Port Louis″ and ″City of Curepipe″. One of them set a record-breaking distance for commercial twinjets on 1988-4-18, when it flew non-stop from Halifax, Nova Scotia to Mauritius, covering a distance of almost 9,000 miles (14,000 km) in less than 17 hours. A contract worth US$8.9 million including spare parts for these two Boeing 767s had been signed a year earlier. Also in 1988, a Boeing 707 was leased from Air Swazi Cargo to operate freighter services, and the first ATR-42 started revenue flights in December, replacing the Twin Otters on inter-island services. A second ATR42 was ordered in September 1989 (1989-09). By March 1990 (1990-03), the route network included Antananarivo, Bombay, Durban, Geneva, Harare, Hong Kong, Johannesburg, Kuala Lumpur, London, Moroni, Munich, Nairobi, Paris, Reunion, Rodrigues, Rome, Singapore and Zurich. A new route to Perth was inaugurated in December 1991 (1991-12). Named ″Paille en Queue″ and leased from ILFC, the first Airbus A340-300 entered the fleet in May 1994 (1994-05); following delivery, a Boeing 747SP that was on lease from SAA was returned. The airline became the first in the Southern Hemisphere to fly the A340-300. A second A340-300, named ″Pink Pigeon″ and purchased directly from Airbus, was handed over by the aircraft manufacturer in October. Services to Brussels and Cape Town were launched in July and November that year. Also leased from ILFC and named ″Kestrel″, Air Mauritius' third A340-300 joined the fleet in April 1995 (1995-04). The airline started trading on the Stock Exchange of Mauritius during the year. In 1996, the last Boeing 747SP was sold to Qatar Airways and direct flights to Manchester were launched. At April 2000 (2000-04), Air Mauritius had 2,000 employees. At this time, the airline had a fleet of five Airbus A340-300s, one ATR42-300, two ATR42-500s and two Boeing 767-200ERs that served a route network including Antananarivo, Brussels, Cape Town, Delhi, Durban, Frankfurt, Geneva, Harare, Hong Kong, Johannesburg, Kuala Lumpur, London, Mahe Island, Manchester, Maputo, Mauritius, Melbourne, Milan, Mumbai, Munich, Paris, Perth, Rodrigues Island, Rome, Singapore, St Denis de la Reunion, St Pierre de la Reunion, Vienna and Zürich. African medium-haul routes started utilising the Airbus A319 following its delivery in 2001. The A340-300 Enhanced version was ordered by the carrier in mid-2005. The A340-300 Enhanced was put on service on the London-Heathrow route in December 2006, soon after delivery. In late 2007, the fleet saw the incorporation of the Airbus A330-200; a second aircraft of the same type was delivered in October 2009 (2009-10). In March 2016, Air Mauritius launched the 'Air Corridor' with its first direct flights to Singapore, which was previously served via Kuala Lumpur. The new route aims at improving air connectivity between Mauritius and Singapore in order to stimulate the growth of passenger and cargo traffic between Asia and Africa through these two hubs. An Air Mauritius Airbus A330-200 on short final to Hong Kong International Airport in 2012. The airline has the Paille-en-Queue, a fish-eating tropical bird, as its symbol,:41 A stylised silhouette of this bird can be seen in the aircraft titles. As of March 2016, Arjoon Suddhoo holds the chairman position and Megh Pillay is the chief executive officer. Sudhdhoo was appointed in March 2015 (2015-03). As of March 2015, Air Mauritius had its headquarters at Air Mauritius Centre in Port Louis, Mauritius. In September 2015 (2015-09), the carrier signed a cooperation agreement with Air Austral, Air Madagascar, Air Seychelles and Inter Ile Air that established Vanilla Alliance and is aimed at improving air services between the Indian Ocean Commission members. Air Mauritius' frequent flyer programme is called Kestrelflyer, which offers Silver and Gold accounts. In July 2014 (2014-07), during the Farnborough Air Show, it was announced Air Mauritius signed a memorandum of understanding with Airbus for six Airbus A350-900s, of which two will be leased from AerCap Holdings and with the option to place additional orders for up to three more aircraft of the type between 2023 and 2025. It is planned that the leased aircraft will join the fleet by end 2017 and the other four will join in 2019 and 2020. An Air Mauritius Airbus A340-300 at Frankfurt Airport in 2011. Aside from the equipment shown above, the airline also has two Bell 206 JetRanger helicopters that are used for tour services. ↑ Torr, Jeremy (27 April 2016). "Mauritius bids for key Asia-Africa transit hub status". Air Transport World. Archived from the original on 30 April 2016. In March 2016, the island’s flag carrier Air Mauritius said it would move its Southeast Asian hub from Kuala Lumpur, Malaysia to Singapore’s Changi. ↑ "Profile for Air Mauritius". Centre for Aviation. Archived from the original on 5 September 2012. Retrieved 5 September 2012. ↑ Bhuckory, Kamlesh (14 February 2012). "Air Mauritius Posts Nine-Month Loss, Plans to Reduce Routes". BusinessWeek. Bloomberg. Archived from the original on 20 April 2012. Retrieved 20 April 2012. ↑ "Air Mauritius wins 2011 Indian Ocean Leading Airline" (PDF). Air Mauritius. 16 September 2011. Archived (PDF) from the original on 24 May 2012. Retrieved 24 May 2012. ↑ "World Travel Awards – Air Mauritius profile". World Travel Awards. Retrieved 17 November 2011. ↑ "World Airline Survey... Air Mauritius Ltd". Flight International: 519. 11 April 1968. Archived from the original on 16 October 2012. Retrieved 16 October 2012. "World airline directory – Air Mauritius Ltd (page 1130)". Flight International: 1130–1131. 22 April 1978. Archived from the original on 16 October 2012. Retrieved 16 October 2012. "World airline directory – Air Mauritius Ltd (page 1131)". Flight International. Archived from the original on 16 October 2012. Retrieved 16 October 2012. Jeziorski, Andrzej (23 August 1994). "Tropical lifeline (page 40)". Flight International. Mauritius: 40–41. Archived from the original on 16 October 2012. "Tropical lifeline (page 41)". Flight International. Archived from the original on 16 October 2012. 1 2 3 4 5 Guttery 1998, p. 124. "Contract flag carriers (page 474)". Flight International: 474–476. 28 February 1976. Archived from the original on 16 October 2012. Retrieved 16 October 2012. "Contract flag carriers (page 475)". Flight International. Archived from the original on 16 October 2012. Retrieved 16 October 2012. "Contract flag carriers (page 476)". Flight International. Archived from the original on 16 October 2012. Retrieved 16 October 2012. 1 2 "World airline directory – Air Mauritius". Flight International. 118 (3716): 277. 26 July 1980. Archived from the original on 19 October 2013. 1 2 3 4 5 6 7 8 9 10 11 12 Guttery 1998, p. 125. 1 2 3 "World airline directory – Air Mauritius". Flight International: 47. 30 March 1985. Archived from the original on 19 August 2013. ↑ "Air Mauritius buys ATR42". Flight International. 127 (3954): 4. 6 April 1985. ISSN 0015-3710. Archived from the original on 19 August 2013. 1 2 "Mauritius-Cathay link to Hong Kong". Flight International. 136 (4183): 21. 23 September 1989. ISSN 0015-3710. Archived from the original on 4 September 2013. ↑ "SAA refuses Queensland request for strike help". Flight International. 136 (4183): 21. 23 September 1989. ISSN 0015-3710. Archived from the original on 4 September 2013. "767 – Extending the range (page 25)". Flight International. 133 (4116). 4 June 1988. ISSN 0015-3710. Archived from the original on 16 October 2012. "767 – Extending the range (page 26)". Flight International. Archived from the original on 16 October 2012. "767 – Extending the range (page 27)". Flight International. Archived from the original on 16 October 2012. ↑ "Air Mauritius horizons broaden". Flight International. 133 (4113): 10. 14 May 1988. ISSN 0015-3710. Archived from the original on 4 September 2013. ↑ "Boeing studies 767 re-wing". Flight International. 133 (4110): 2. 23 April 1988. ISSN 0015-3710. Archived from the original on 4 September 2013. 1 2 "Boeing 7-Series – Fast Facts: Boeing 767". Boeing. Archived from the original on 20 April 2012. On 18 April 1988, an Air Mauritius 767-200ER set a new distance record for commercial twinjets--flying 8,727 statute miles (14,042 kilometers) from Halifax, Nova Scotia, to Mauritius in 16 hours and 27 minutes. ↑ "Who's selling". Flight International. 4077 (132): 32. 29 August 1987. ISSN 0015-3710. Archived from the original on 4 September 2013. Aero Systems of Miami has celebrated its 30th anniversary with a $8.9 million order from Air Mauritius for spares for its two new Boeing 767-300ERs. ↑ "News in brief – ATR orders". Flight International. 136 (4183): 17. 23 September 1989. ISSN 0015-3710. Archived from the original on 7 August 2012. Air Mauritius and Trans World Express have each ordered an ATR42. ↑ "World airline directory – Air Mauritius". Flight International. 137 (4207): 58. 20 March 1990. Archived from the original on 4 September 2013. 1 2 "Air Mauritius expands its fleet with new Airbus A340-300E aircraft" (Press release). Airbus. 27 June 2005. Archived from the original on 31 July 2012. Retrieved 31 July 2012. 1 2 "World airline directory – Air Mauritius". Flight International. 157 (4722): 63. 10 April 2000. ISSN 0015-3710. Archived from the original on 20 October 2013. ↑ "Marketplace". Flightglobal.com. Flight International. 16 May 2000. Archived from the original on 12 September 2012. Retrieved 12 September 2012. Air Mauritius has ordered two CFM International CFM56-powered A319s, for delivery in the third quarter of 2001 and third quarter of 2002. ↑ "Air Mauritius to add three A340-300Es to fleet". Air Transport World. 28 June 2005. Archived from the original on 12 September 2012. Retrieved 12 September 2012. ↑ "Other News - 04/14/2006". Air Transport World. 17 April 2006. Archived from the original on 12 September 2012. Retrieved 12 September 2012. Air Mauritius announced an overhaul of its long-haul product beginning in December on its route to London-Heathrow operated with two soon-to-be-delivered A340-300Es. ↑ "Other News - 11/16/2007". Air Transport World. 19 November 2007. Archived from the original on 12 September 2012. Retrieved 12 September 2012. Air France Industries signed a multiyear contract with Air Mauritius for overhaul of 31 CFM56-5C engines and component maintenance of two new A330-200s to be delivered this month and at the end of 2009. ↑ "Other News - 10/29/2009". Air Transport World. 30 October 2009. Archived from the original on 12 September 2012. Retrieved 12 September 2012. Air Mauritius this week took delivery of a second A330-200 powered by GE CF6-80E engines. ↑ "Launch of the 'Air Corridor' today 11 March 2016 with the first Air Mauritius flight taking off at 20h40" (PDF). ↑ "Board of Directors". Air Mauritius. Archived from the original on 17 March 2016. ↑ "Dr Arjoon Suddhoo appointed Chairman of Air Mauritius Board of Directors" (PDF) (Press release). Air Mauritius. 9 March 2015. Archived from the original (PDF) on 24 March 2015. 1 2 3 "Annual report 2013/14" (PDF). Air Mauritius. Archived (PDF) from the original on 17 May 2015. ↑ "Air Mauritius Annual report 2014-2015" (PDF). airmauritius.com. Air Mauritius Group Plc. 18 June 2016. Retrieved 21 June 2016. ↑ "Air Mauritius Financial Highlights". www.airmauritius.com. Retrieved 2016-06-21. ↑ "Timetable (Effective 29 March 2015 (2015-03-29) – 24 October 2015 (2015-10-24))" (PDF). Air Mauritius. Archived from the original (PDF) on 2 May 2016. ↑ Hofmann, Kurt (25 September 2015). "Indian Ocean airlines seal Vanilla Alliance". Air Transport World. Archived from the original on 11 October 2015. ↑ "Profile on Air Mauritius". CAPA. Centre for Aviation. Archived from the original on 2016-11-11. Retrieved 2016-11-11. ↑ "Singapore Airlines And Air Mauritius Sign Codeshare Agreement". www.singaporeair.com. ↑ "KestrelFlyer". Air Mauritius. Retrieved 21 June 2011. ↑ "Air Mauritius selects A350-900s to replace its fleet of A340-300 aircraft" (PDF). Air Mauritius. 16 July 2014. ↑ "FARNBOROUGH: Air Mauritius signs for six A350s". 16 July 2014. Archived from the original on 16 July 2014. ↑ Walker, Karen (16 July 2014). "Air Mauritius to buy four A350s, lease two more". Air Transport World. Archived from the original on 16 July 2014. 1 2 "Discover Our Fleet". Air Mauritius. Archived from the original on 2 May 2016. Retrieved 4 August 2016. ↑ "Air Mauritius Newsletter". www.airmauritius.com. Retrieved 2016-07-19. ↑ "Air Mauritius reçoit son troisième ATR". Air Info. 2016-07-27. Retrieved 2016-07-27. ↑ "Helicopter Tours". Air Mauritius. Archived from the original on 11 August 2012. Retrieved 11 August 2012. ↑ "Profile for: Air Mauritius". AeroTransport Data Bank. 13 June 2013. Archived from the original on 13 June 2013. 1 2 "World Airline Directory – Air Mauritius" (pdf). Flight International: 879–880. 2 April 1983. Retrieved 18 April 2011. "Mauritius Pt 1: Africa-Asia hub develops with Air Mauritius 12th Asian destination, AirAsia X launch". CAPA Centre for Aviation. 14 July 2016. Archived from the original on 31 July 2016. "Mauritius Pt 2: Air Mauritius faces intensifying competition and challenges in developing a new hub". CAPA Centre for Aviation. 14 July 2016. Archived from the original on 31 July 2016.